2015 Update: I've been blogging for so long that sometimes I question my very early reviews. I've grown so much since then, so will I now appreciate a flavor like this? Meh, not really. 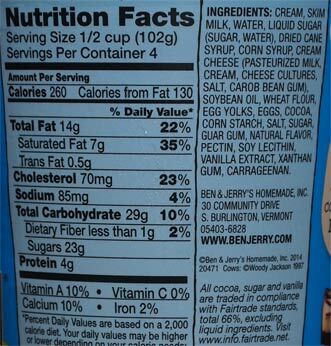 Don't get me wrong, it's typical Ben & Jerry's quality and there are a ton of brownie chunks in my serving. As my original review (see below) was trying to point out, this is CHEESECAKE brownie, not some 50/50 balance. The chunks are there for texture, but the milk & cream ingredients only serve to enhance the cheesecake flavor with the brownie flavor lingering in the background. In other words, this is a fine product made for cheesecake lovers, not brownie lovers. After all these years, I still expect to see a swirl when I open this pint. Original 2008 Review from when it was ONE Cheesecake Brownie: You know how a cheesecake can sometimes attract non-cheesecake lovers? we once had a peanut butter cup cheesecake that was out of this world. 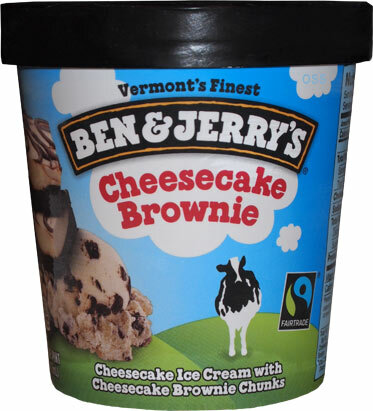 Well, this new flavor from Ben & Jerry's isn't breaking any boundaries and I only recommend it for cheesecake lovers. It's kinda weird but the cheesecake flavor doesn't hit you on every bite, just now and then. However, take a break, and the only taste you are left with is cheesecake. I guess the problem is that upon seeing the container, you expect to open it up and find cheesecake ice cream swirled with chocolate and brownie bites. Instead, there is no swirl and you just get an occasional chocolate covered cheesecake bite. At the very least, I expected a much stronger brownie taste, but it's almost non-existent. I'm really disappointed, I guess I set my expectations way too high on this one. 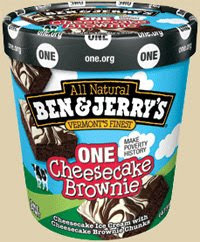 On the positive side, this flavor is trying to help bring attention to the ONE movement which is trying to end poverty. Hey man, maybe you can help me out. Very recentlly I bought a pint of Ben & Jerry's Cheesecake Brownie Ice Cream and it was just cheesecake flavored ice cream with super-moist brownie chunks in it. 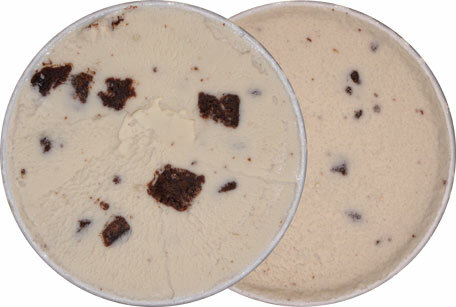 One week later, I bought another pint, but this time it was called "One Cheesecake Brownie" and it is totally different! The latter has the tangy, yogurty cheesecake flavored ice cream and the chunks are now cheesecake brownies and they are much dryer, lighter brown, etc.. Anyway, there is absoluitely no mention of the first flavor anywhere online, not one word. Any idea what's going on there? Yeah, like you, I was as equally disappointed with this, too, because I set my expectations too high. 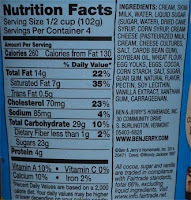 This is Ben and Jerry's though, so it's not that this is a BAD flavor; it's just not one of my favorites from them. It's a nice flavor for vanilla lovers who want something a little different than vanilla ice cream and it's a good way to try Ben and Jerry's amazing brownies in a non-chocolate flavor, although I prefer the brownies in half-baked because these cheesecake brownies take on a dark chocolate flavor as opposed to the fudge brownies in the half-baked flavor which are milk chocolate. I'd like to see Ben and Jerry's come out with a peanut butter cheesecake flavor but I doubt we'll see that anytime soon since they have already created five different types of cheesecake flavors. More like cheesecake cookie, not brownie.